Where have we been you ask? I want gorgeous shots of beautiful kitchens you shout! Well never fear Jamie Williams Design will deliver....right now. We’ve been working tirelessly to get this last kitchen installed. 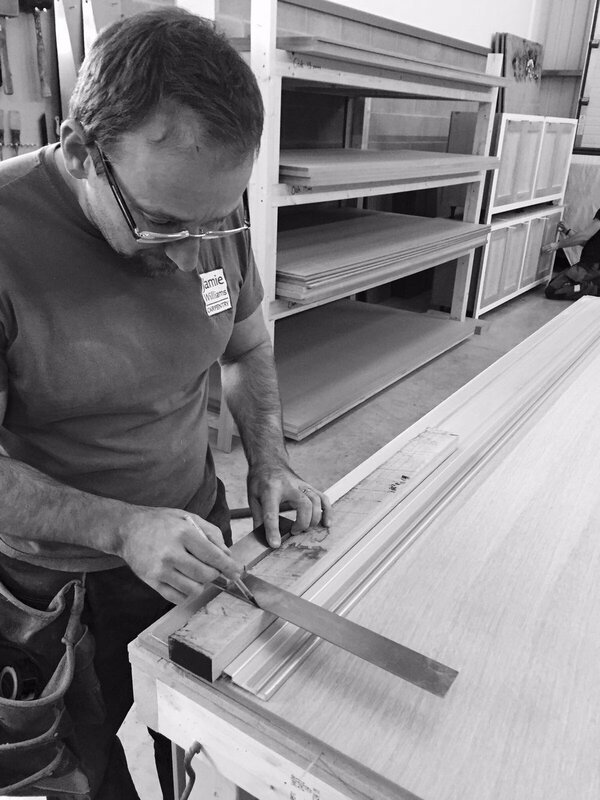 Crafting perfection takes time and our customers come first above all else on any project, so we make no apologies to you blog readers ;). So let’s see it then....hold up a second, let me tell you a little bit of back story. A while back you would have seen the CAD designs for this project. The accuracy and detail of our designs really help us and you visualise the finished product but also recommend and maybe even dissuade (sometimes) certain ideas you may have. The design is ready so what next? Your kitchen is a very hands on and tangible item, the kitchens we build at JWD don’t just appeal to your visual senses but also your touch. Premium material choices not only make your kitchen feel great but also help it stand the test of time. Our client wanted the best of the best and we delivered with solid oak in frame designs and concealed hinges to create a seamless look. Classic vintage brass handles allow easy opening of drawers and cupboards and smooth drawer runners with soft close ooze quality. This functional kitchen also boasts a spacious larder to house sundries and small appliances leaving the kitchen worktops uncluttered and clean. White marbled worktops and brushed metal fittings top off the cabinets and add to the super clean and country classic theme of the kitchen and with fitted appliances there really isn’t anymore you could ask for. 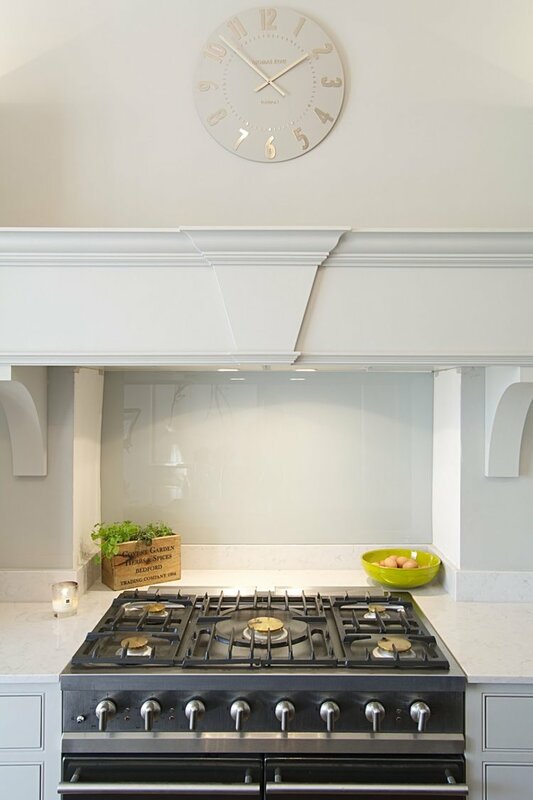 Our client also wanted a classically styled mantel to sit above their range cooker. We think it finishes this project off nicely and conceals the extractor fan. We love kitchens that blur the line between classic styling and modern features and this one does just that. We have numerous projects underway with completion dates early next year so we will leave you with a few images from the photo shoot we had done on this project to whet your appetite for future projects. Enjoy! 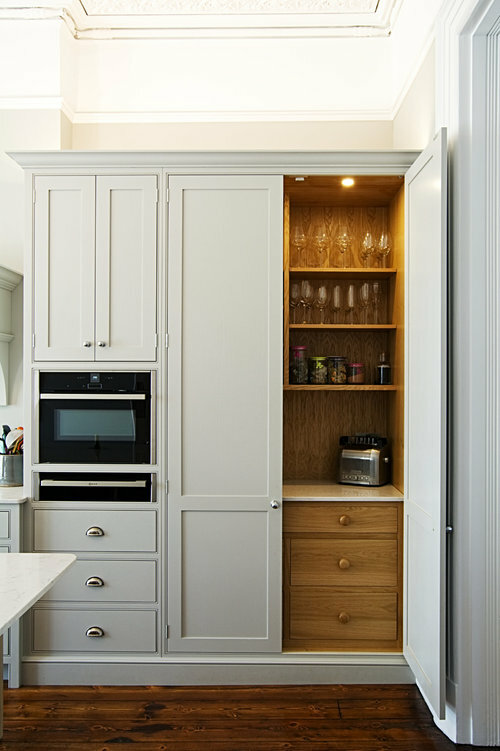 If you are looking for a new bespoke kitchen then you’ve come to the right place. 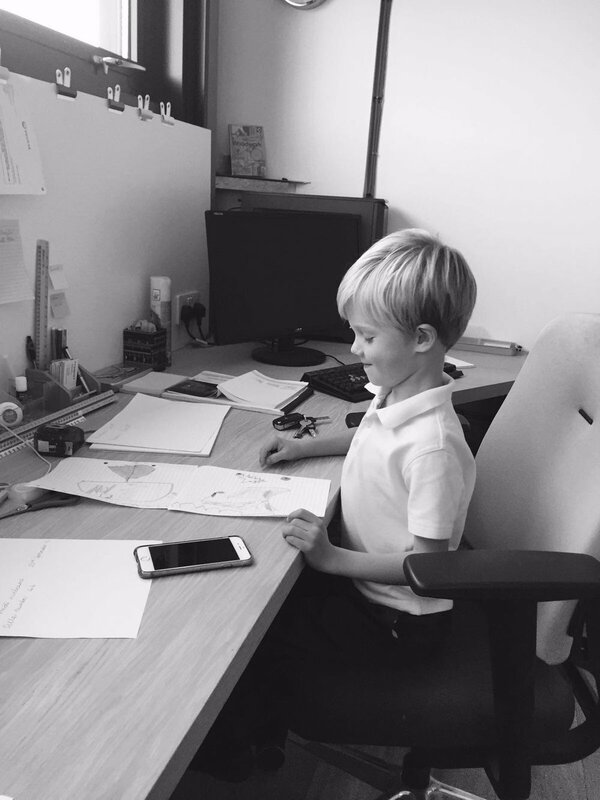 Why not contact us or come in to our workshop office to book a consultation with Jamie and get your project underway. 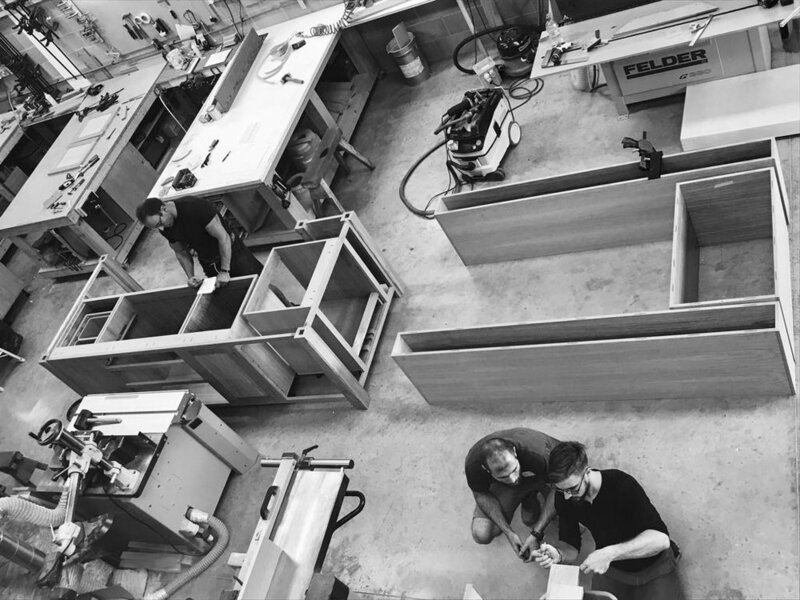 Here at Jamie Williams Design, we have been extremely busy creating the finest kitchen for the talented chefs at the Cheltenham Food Festival. We are honoured to have been invited to display our beautiful kitchen which showcased our highly skilled craftsmanship and close attention to detail. 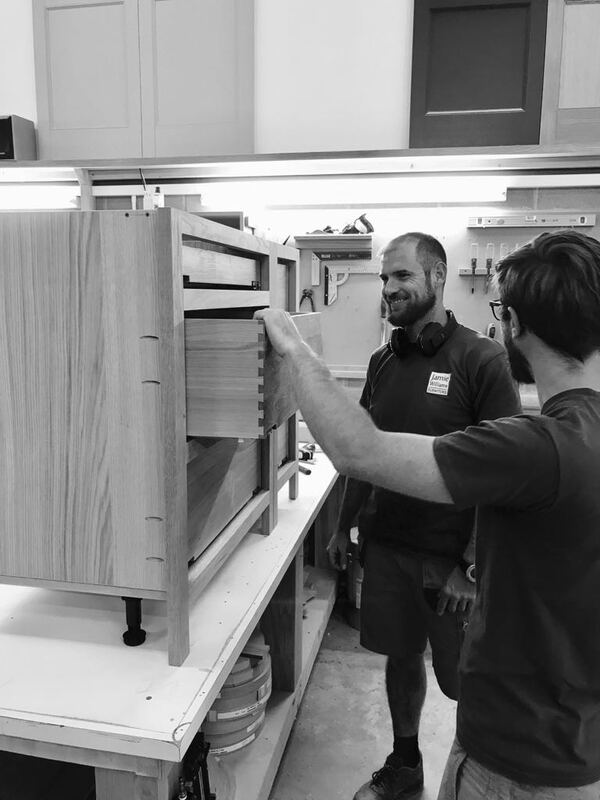 The boys down at the workshop have been busy this week, we thought it would be a good idea to give you a little update on what's going on at Jamie Williams Design. 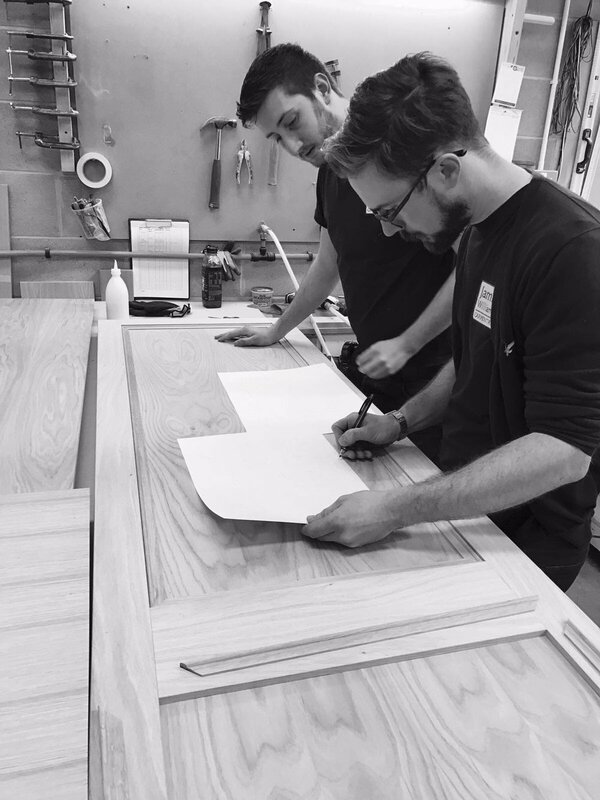 As you will see in the pictures, units are being constructed by our skilled craftsmen, our oak framed design is one of the sturdiest and most hardwearing around so these units will last a lifetime and more. No detail is left to chance with screws hidden and dovetails fitting like a glove. You may also have noticed a Belfast sink and a few appliances already being built into their units. We want everything to fit perfectly so having the appliances to hand really help us to get the quality you would expect from Jamie Williams Design. WOW! Solid oak in-frame Shaker style kitchen within beautiful Grade ll listed building, Cheltenham. WOW! Solid Oak frame kitchen in Greek revival villa in Cheltenham. Traditional shaker kitchen with bi-fold doors and dining space. So you've all seen our excellent bespoke wardrobes and furniture. But how did it get there and who built such expertly crafted pieces? Well it was none other than the Jamie Williams Design team. 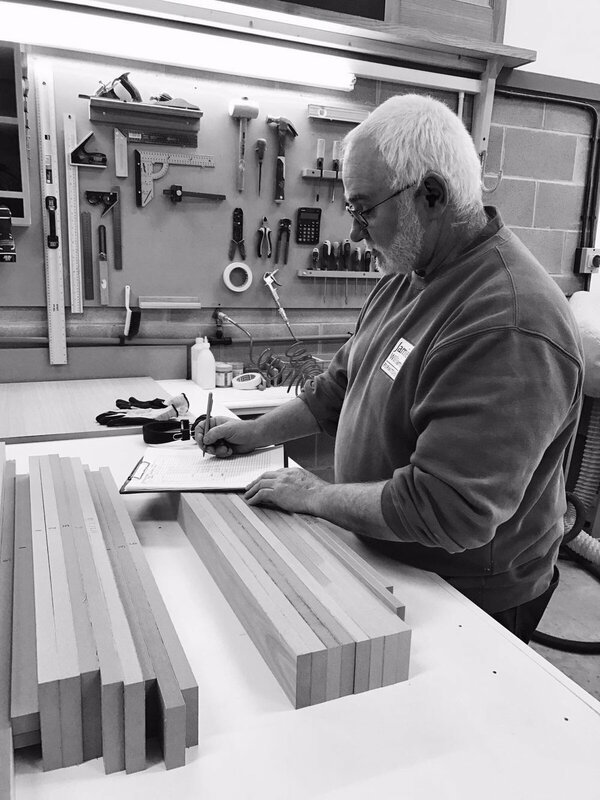 Check out our Team page to see each member of our workshop team. Dan (workshop Guru) running through some details of a new bespoke kitchen design. Attila making it look easy! Only the best leaves our workshop. Roman working through a cutting list - measure twice, cut once! Matt is taking a day off CAD design to help the assembly line. Ollie Williams - Coming up with new ideas! Matty adding another coat in the spray room. We love an even finish! This bookcase is the perfect fit for this downstairs library. Amazing walk-through bookcase for an historic Cotswold property. Amazing walkthrough bookcase in construction.